Here's how Allen & O'Hara became EdR. As most growing companies, our identity has changed and evolved over 60 years. We began as Allen Bros. Construction Co. in 1952. We became Allen & O'Hara and built Holiday Inns across America. In 1964 Allen & O'Hara began developing student residence halls on or adjacent to land-grant university campuses. :H ZHUH WKH ¿UVW QDWLRQDO SOD\HU LQ ALLEN & O'HARA collegiate housing. Allen & O'Hara became a strong brand known for integrity, creativity and quality. 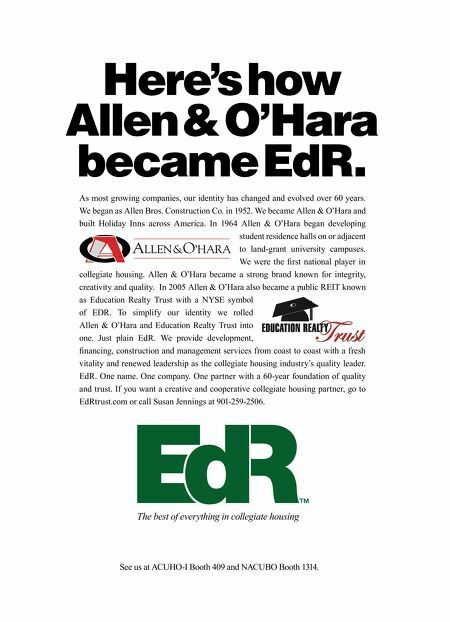 In 2005 Allen & O'Hara also became a public REIT known as Education Realty Trust with a NYSE symbol of EDR. To simplify our identity we rolled Allen & O'Hara and Education Realty Trust into one. Just plain EdR. We provide development, ¿QDQFLQJ FRQVWUXFWLRQ DQG PDQDJHPHQW VHUYLFHV IURP FRDVW WR FRDVW ZLWK D IUHVK vitality and renewed leadership as the collegiate housing industry's quality leader. EdR. One name. One company. One partner with a 60-year foundation of quality and trust. If you want a creative and cooperative collegiate housing partner, go to EdRtrust.com or call Susan Jennings at 901-259-2506. 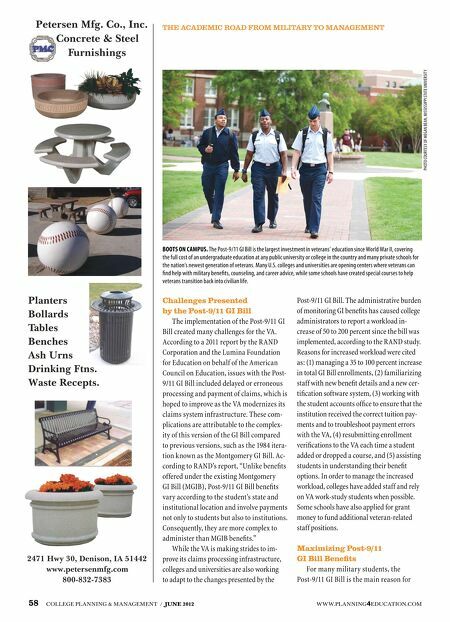 The best of everything in collegiate housing See us at ACUHO-I Booth 409 and NACUBO Booth 1314.